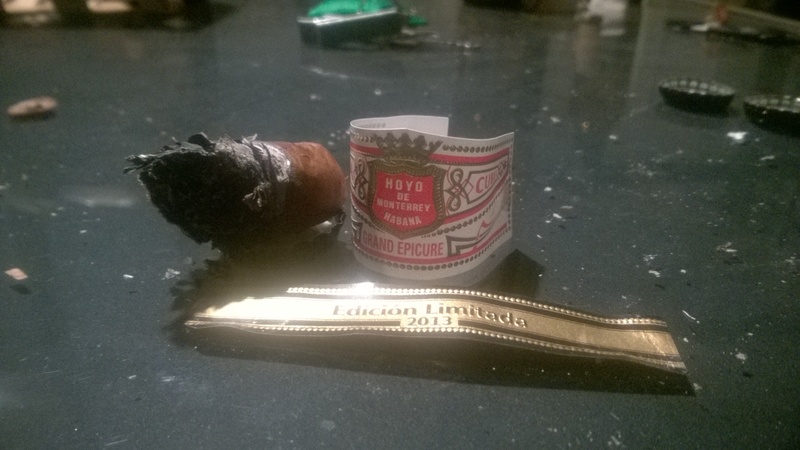 The Hoyo de Monterrey Grand Epicure was released in 2013 to mixed reviews. Some liked the profile, which was a bit more in keeping with its marque than most Edición Limitadas. Others complained about the erratic construction. Its stable mates were the Romeo De Luxe and the Punch Serie D’Oro No. 2; of the three, the D’Oro got the press. The first limited from Punch, and a Pyramid in a brand where those are very thin on the ground. Ultimately, though, all three of 2013’s ELs would slip away into the mists of forgettability. The Grand Epicure is about as vulgar as they come, with its 55-ring gauge and double-sized custom band, but if you put aside the design then this example looks to be a good one. The wrapper is dark and oily, and construction appears perfect. The draw could be firmer but is well within the threshold of acceptability. 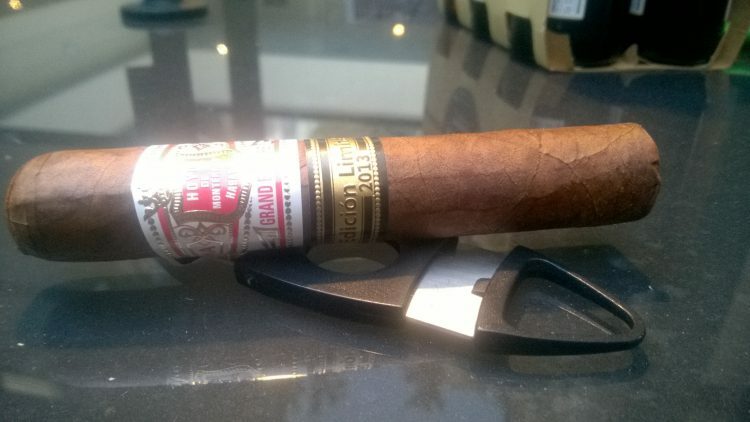 Lit, the cigar is smooth and rich. The predominant flavours are of the forest floor – fungus and wet dirt. The wood is there, of course, but it isn’t the standard dry cedar or the tannins of fresh cut sapling; it’s something darker. Cuban mahogany. There are few triter clichés than that of the favourite teacher; the sage whose lips let spill the viscous pearl of wisdom into a wiling teenage ear, converting a wild hoodlum into a productive member of society. For me, the Sage’s name was Dr. Penny Marceau. The high school I attended was a select entry college for academic boys. The faculty at all times placed great emphasis on preserving the culture of the place. Classes were formal business, and to be taken seriously. Competition was high. Discipline was expected. The VCE literature master was Giorgio Demetriou, well known throughout the school for his short fuse and fits of rage. Even the non-literature inclined knew him well, as any classroom remotely near his would inevitably find themselves snickering at the sound of his screaming rampages coming through the walls, and the line of boys outside his door who had been thrown out for some infraction or other. In year eleven it was my turn to spend time with Giorgio, but a last-minute reprieve changed the course of my life. Over the summer break, one extra student transferred into literature, taking the size of the class over the government mandated maximum. The cohort was cleft in twain, and I wound up in the B stream; eleven boys and a temp teacher named Dr. Marceau. The class lacked the formalities of the rest of school life. With Dr. Marceau we sat on the floor and chatted casually. We read Shakespeare and Don DeLillo. Peter Carey and Tennessee Williams. Up to that point I’d always been an avid reader of pulp fantasy garbage: Dr. Marceau’s class changed that. One-week she saw something with a dragon on the cover sticking out of my blazer pocket, and the next she gave me her well-thumbed copy of One Hundred Years of Solitude to read on my own time. “Read this” she said. “It’s fantasy with meaning.” I’ve never looked back. Since a young age I’d always written creatively, but never been met with anything more than an eye-roll from adults. Dr. Marceau took me seriously. One afternoon, instead of handing my essay back like she did everybody else’s, she held me after class and spent hours going through it sentence by sentence with me, trying to instil in me a feel for the rhythm of language. Of course, the school kept her on, but I never had her again. 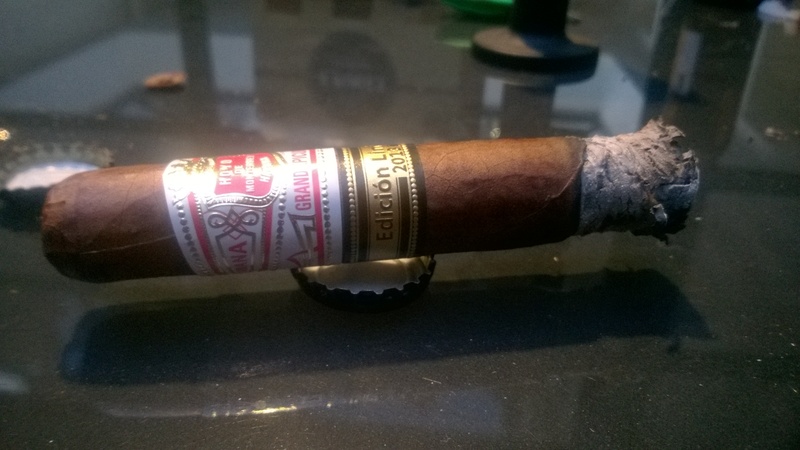 At the mid-point the cigar is sweet, and extremely smooth. The term “elegant” fits it very well. It is soft and creamy. The tobacco is light and floral, with only the slightest high of cedar. “Oh, hi” she said, clearly without any memory of me. “I’m the head of tech at a start-up,” I said, and watched her face fall. With a sneer, she began to turn away. Desperately I called after her. But she wasn’t listening. I was just another disappointment. Right to the end, the cigar remains extremely smooth, never bitter for an instant. Most of the final third is notes of buttered toast and nuts. In the last moments some of the forest floor from earlier returns, with fungal notes and the petrichor funk. 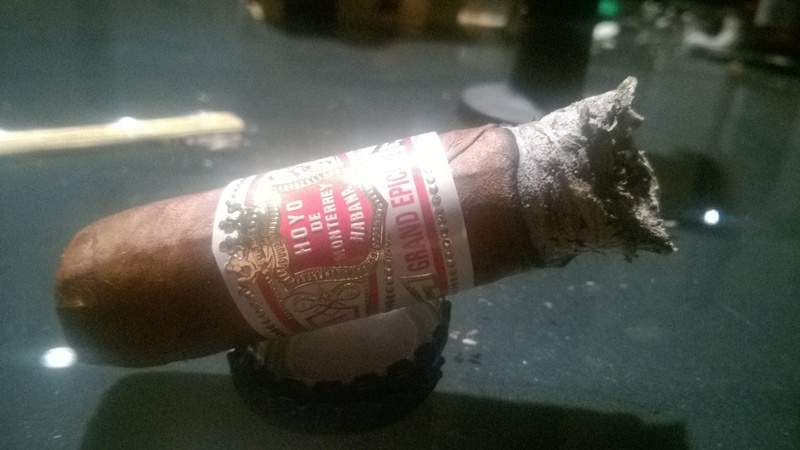 Above all though, the chief attribute of the Hoyo de Monterrey Grand Epicure is smoothness. An elegant, relaxing, and wonderful smoke. Quite a claim for a 55-ring gauge cigar with barely five years of age on it. A long way better than the Epicure 2.